This is the story of our dog Rocko. She wasn’t our dog to begin with. My mother, father and sister got her when she was just a few weeks old. She was the smallest dog in the litter and had to stay a while before she could go home with them. Rocko was their fourth dog and the smallest by far. The only full breed. 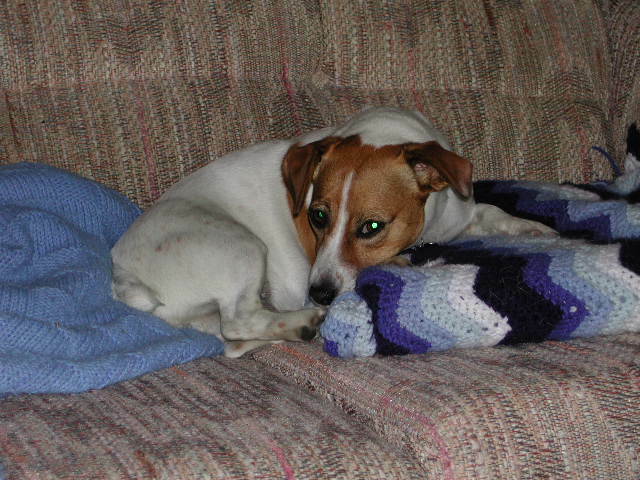 A short-legged short hair Jack Russell Terrier. My sister named her Rocko after the Nickelodeon show “Rocko’s Modern Life“. The main character was named Rocko and he had a dog. My sister just combined the two. She was so tiny. We purchased a cat collar for her and still had to add another hole so it wouldn’t slip off her neck. My dad was getting sicker. 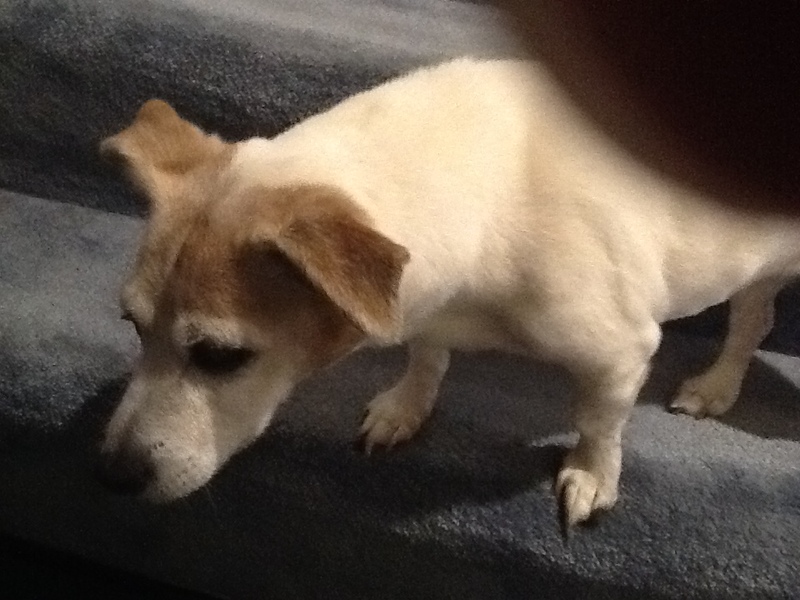 In the past, my parents had never let any dog upstairs in the house. But Rocko came up to keep my dad company and slept on his pillow. She liked to burrow and seek our warmth and we’d find her under blankets and in laps. She would just curl up and sleep, resting her head on your feet or your leg. Over the next year my mother and sister got two more dogs, rescuing them from shelters. 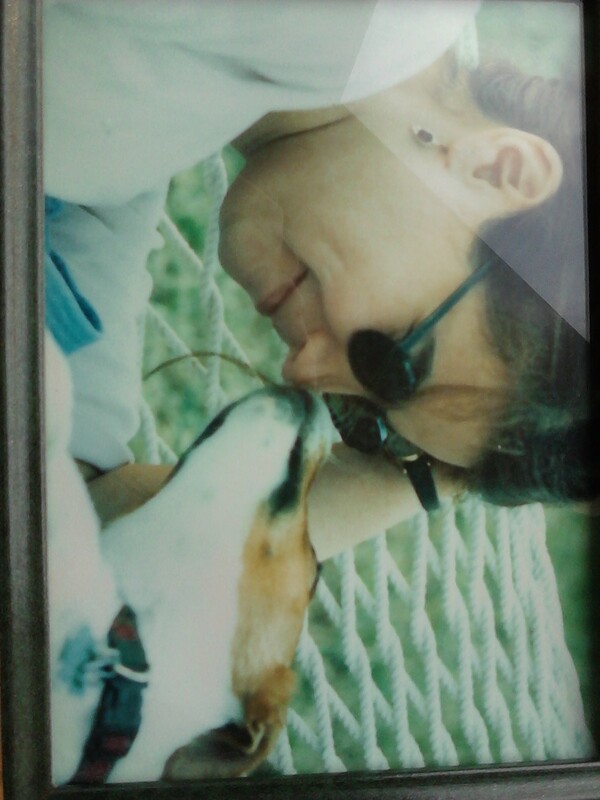 My dad died the November after they got Rocko. I moved back home. It was my mother, my sister, me and six dogs. As she aged, Rocko became more aggressive towards the other dogs. Apparently this happens sometimes with Jack Russells, but we didn’t know. We spent a lot of time making sure the dogs were separated when we were out. I came home one evening. My mother and sister weren’t there. All I saw was a trail of blood that looked like something out of a horror movie. Somehow the dogs had broken through the gates meant to keep them apart. Rocko had attacked three of the other dogs, two severely. My mother came home and took the injured dogs to the vet. The next day, Rocko went there to be sequestered. I couldn’t take her. I was in the legislature living in a hotel half the year and half the year I was home. Tim and I were dating at the time and in his true white knight fashion he agreed to take her in his house in Massachusetts until we could find a home for her. A “foster dog” situation. On a cold winter afternoon, I drove her down to be with Tim. I called a bunch of Jack Russell Rescue places. Had a few leads on places with our requirement : no other dogs. But I couldn’t pull the trigger to let her go. So she stayed. For 13 years. And there through the arrival of all three of our children. Rocko would sleep wherever we were but she was particularly fond of under the covers at the foot of our bed. Until I found a tick in our bed and moved her on top of the covers under her own special blanket. She was part of my favorite new parent story ever. Gerry was a terrible sleeper when he was a baby. I had finally nursed him back to sleep after a long middle of the night awake stretch. He had fallen asleep on my arm and I had to pee. Not wanting to move him, I wriggled out of my nightgown and went to the bathroom naked. I tip-toed quietly to the bathroom, did what I needed to do, and walked quietly into the dark. As I made my way to the bed I heard a huge THUD. I screamed and flipped the light on, thinking it was Gerry falling off the bed. It was Rocko hopping down to find me. Staring at naked me in the bright light was Tim and now a wide awake – and now crying – Gerry. She is also part of one of my scarier moments as a parent. A now toddler aged Gerry was jumping around on our bed and landed on her tail. Rocko turned around and snapped at him. Not biting, but enough of a reaction that we started the search again for another home for her. Again, we couldn’t pull the trigger. But for the next seven years, she was never left alone with any of the kids. And she never slept on the bed again. 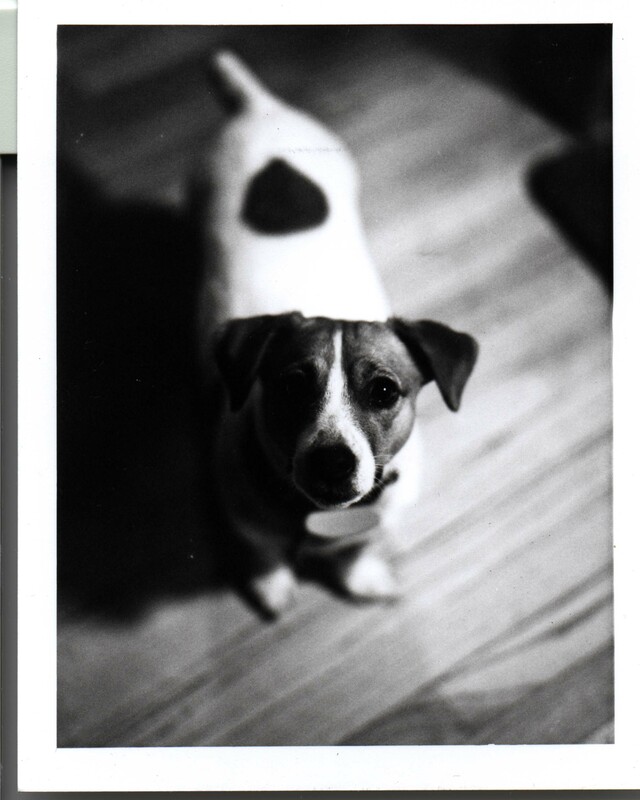 We said goodbye to Rocko last week. She would sleep all day and walk around all night. She had “dry eyes” meaning her eyes didn’t produce tears. 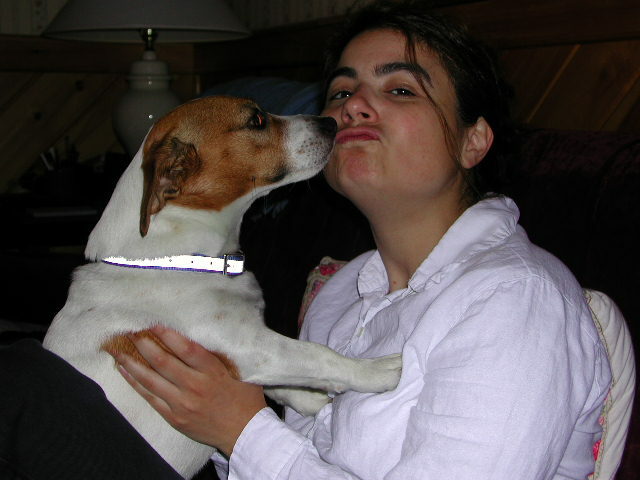 For several years Tim put drops in her eyes to ease the pain, but she was now completely blind. She had fallen down the stairs too many times because she couldn’t see. She slept on Tim’s side of the bed on the carpet under his nightstand and never left that spot. We carried her out to pee. And even then she would pee or throw up in the house. She peed on her water bowl and barely ate. She didn’t know when we were there or even sensed where we were. I shook the whole time that Tim was away with her at the vet. We know she went peacefully. Her last picture. Excuse my knee in the way. When Tim got home and the kids were asleep, I sat down with him on the couch and sobbed. I didn’t even know these tears existed for her. I just curled up in Tim’s arms and cried. Just as I had 14 years ago at the cemetery after burying my dad. “We’re never getting rid of that chair, are we?” Tim said. I shook my head no and laughed through the tears. “I loved her too, you know.” Tim said quietly. He had been her primary caregiver for 13 years now. As we had more children, more dog responsibilities fell to him. This was his pain as much as mine. 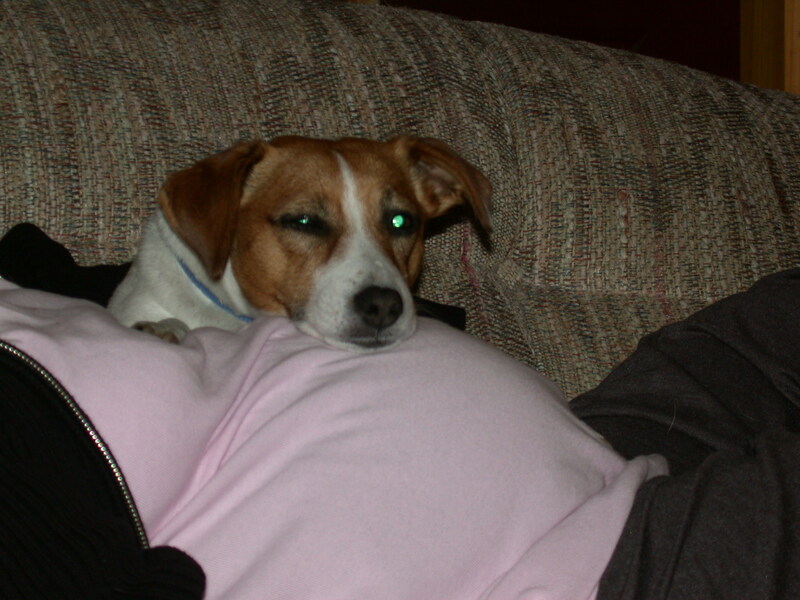 We sat together on the couch quietly remembering Rocko. Telling the kids was one of the hardest things I’ve done as a parent. I googled “how to tell your autistic child about the death of a pet” and didn’t get much. The “Rainbow Bridge” poem just doesn’t work for our not very religious, incredibly literal family. So we told them the truth. Their reactions matched their personalities exactly. They all wanted another dog instantly. This will be a process. For us all. You weren’t a great dog. But you were our dog. I slipped your collar into the pocket of Dad’s coat. A huge thank you to the incredible doctor at the Northern RI Animal Hospital for being there for us all. You were my lifeline. I happened to see a post from a business on Facebook that they had entered a contest. Our nonprofit SenseAbility Gym needed that grant. Our community needed that grant. On November 14, I saw our logo listed on the site. My heart jumped. I shared it with some incredible amazing fantastic wonderful friends. Seriously. There aren’t enough superlatives to describe them. And they got to work. They instantly started sharing the contest and our link on their Facebook pages and Twitter feeds. My friend Patty’s husband Bil suggested we create a Facebook event to remind people to vote. He told me to make it public so everyone could see it in their newsfeeds and anyone could invite people to it. My friend Lexi blogged about it. Twice. So did my friend Kristin. What happens when over 2400 people are invited to a Facebook event, and over 400 people actively voting on Facebook, and hundreds of people write Facebook posts daily begging friends to vote (under threat of postings of cat pictures all over their timelines)? What happens when there are many many tweet and retweets, and more postings in Facebook groups and on blog pages asking people to vote for us? What happens when people who don’t even know us invite their Facebook friends to vote for us because they have a child with special needs and believe in our idea? What happens when my husband is voting for something through Facebook for the First. Time. Ever? What happens when you add one good idea plus hundreds of incredible friends with amazing social media presence plus a special needs community that comes together to support their own? It equals over 3300 votes for our little nonprofit gym in only ten days. Cheering us on. Joining us as we watched our numbers rise from 500 votes to 1000 votes to 2000 votes to the “holy crap we crossed 3000” vote tally. People posting their vote number on our Facebook event page with pride and excitement. This unbelievably dedicated and supportive community grew up around this voting contest. And put us in a position to be in the Top 10 of all the businesses entered. Part of the mission of our business is Community. SenseAbility Gym wants its members to feel welcome, and part of the special needs community. You’ve done that for us 3300 times over now. This grant would be a game changer for us. It would be a game changer for the families in our community. We want the families around us to feel as supported and loved as we have felt over these past 10 days. Thank you for believing in us and our idea. Thank you for believing in our children and their potential. Thank you for being our friends. If you read this before 11:59pm on Nov 24th and want to vote: CLICK HERE! Now I need your vote. SenseAbility Gym, the sensory gym that we are opening in Massachusetts, is up for a chance at a $25,000 grant from FedEx. Businesses from all over the country are competing for this money in an online contest. SenseAbility Gym was established in May of 2012 as a sensory gym for special needs kids. As moms of children with autism, we have found that there are a couple occupational therapy centers in the area that occasionally offer public open gym time, but there is nothing in the area that provides the year round open gym services. With the autism rate rising to 1 in 88 children, we knew many special needs families needed a place for their children to play safely and find support and acceptance. 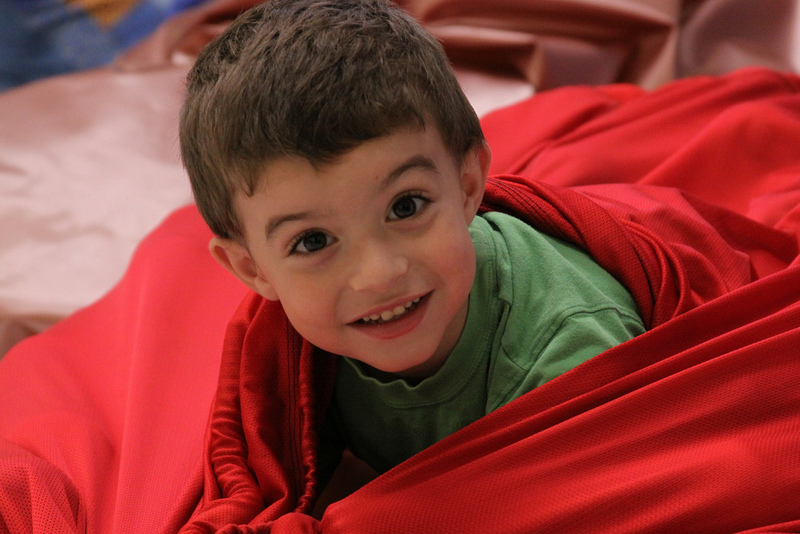 We’re a non-profit relying on donations, grants and fees paid by families who will use our gym. There is no other business like ours in central Massachusetts that provides the services that we will. We believe that children deserve access to the equipment used in their schools and therapy clinics. This will be a place where parents and children can go to socialize with other families with similar challenges. Our community needs this grant to get our doors open for these families and stay open. The $25,000 grant will go directly into the programming and operation of the gym. We need specific therapeutic equipment for the gym that is expensive (things like therapy swings and safety mats). We are also offering specialized classes for kids in social skills and life skills and the money will go towards offering those at reduced rates. This grant will allow us to use other private donations for direct operating costs, giving us the rest of the money we need to open to the gym for families. We need your vote today. And every day until November 24th. Click HERE to vote directly. Click HERE to join our Facebook event page for information and reminders to vote. Click HERE to make a donation to our gym. On behalf of all the kids in our community who will benefit from this, we thank you. Two weeks ago, we had our annual IEP meeting for Lewis. We sat at the preschool a few days before he turned four and decided he no longer qualifies for direct speech therapy. I took another sip of my wine and I opened the coat closet. I was spending the evening gathering up blankets, shoes, and sheets to donate to a clothing drive for the victims of Hurricane Sandy. The Girl Scout troop in our town arranged for a large truck to be at our high school in the morning and I wanted to help fill it. I found sweaters that were still packed up from our move six years ago. Crib sheets that were of no use to us anymore. Winter boots that my kids had outgrown years ago. All into the box. The posting came on Facebook that what they really needed were jackets. The weather was about to get quite chilly and no power means no heat. So out came another empty box. And to the coat closet I went. I moved some winter jackets around and some rain coats. The ones that still fit my kids went to one side. The LL Bean pullover fleece that I hadn’t worn in years came out. As did a button down Gap jacket. My dad’s old gray Black Diamond fleece coat. It’s been hanging in one coat closet or another of mine for almost 14 years now. One of three articles of clothing that I have of his. I don’t wear it. Ever. It hasn’t been washed since he died. It just hangs there in the closet. No matter what season, that coat stays. I can still see him in that coat even after all this time. It’s that soft heather gray color with black trim around the collar. It was an in-between season coat – not quite warm enough for a winter coat but too warm for early fall and late spring. A “mud season” coat I guess. Going by Vermont seasons. He had a gray Black Diamond vest that was just like it and he wore that all the time when he was sick. When I think back to the memories of him those last months, he’s in that vest. I don’t know where that vest is now. And really I never understood the vest anyway. How does that keep you warm? I need something that covers me…something that envelopes me. Something I can feel secure in. Like a big fleece hug. The big fleece hug hung there in the closet. It was begging me to donate it. It makes sense, right? After all these years it should go to someone who really needs it. To someone from the hard hit areas of Long Island where my dad grew up. Or to someone from the city where he first taught. And considering how much he gave to others in his life and how much he taught us to give back, shouldn’t I give up this coat so that someone else can use it? So that a father can wrap it around his daughter to keep her safe and warm? I pushed the coat aside and pulled out a 3T sized raincoat. I closed the coat closet door. The memories are starting to fade after all these years. Some days I feel him so close, other days he’s so far away. I try to remember things but I can’t. It’s just a coat. But I still need it. I take the 3T raincoat and put it on top of the box. I slip some money into the pocket of the LL Bean pullover fleece, hoping to bring a “Hey! Found money!” smile to whomever wears it next. Tomorrow I’ll put the boxes in the car and bring them to the high school. I sit here now in the dark with another glass of wine. The coat is just on the other side of the wall. It will stay with me for a while longer. And how my coat of many colors, was worth more than all their clothes. Take a moment to donate what you can to relief efforts on the East Coast. My family and my friends who are like family need your support. If you can’t donate money, find a drop off location for coats, blankets, shoes, and non-perishable items.